Graduate of the Military Medical School, Aristotelio University of Thessaloniki. Since then served as a permanent officer-Doctor of the Navy. I was awarded the degree of specialist Physician in Internal Medicine ,from Medical University of Thessaloniki. 1980: After completing my thesis on “ Antibodies to a liver specific membarane franction (L.S.P), in patients with liver disease”, at the King’s College London Hospital , Liver Unit, I was awarded the M.D title. 1975-1978: Senior Registrar of the 1st Division of Internal Medicine Dpt. Of Naval Hospital Athens. 1979-1981: Postgraduate in Liver Disease Unit of King’s College Hospital London, being Honorary Senior Registrar and Research Fellow. 1993: Honorary discharged from the Navy with the rank of Commodore – Physician. 1993-2005: Affiliated full time as a Consultant Physisian- Hepatologist at”Hygeia” , Athens Hospital. 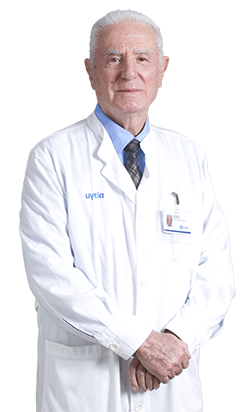 From April 2011: I am fully occupied as a Consultant Physician –Hepatologist at “Hygeia” Athens Hospital.